When you think of precision watchmaking, you generally think of Switzerland, not England, but that’s where Graham watches got their start. Founded by English watchmaker and inventor George Graham in the 18th century, the company is today based in Switzerland, and manufactures high quality, elaborate and boldly styled timepieces. The company favors attention-getting looks, mechanical complications, and oversized cases. Their attention to detail is remarkable, and there are few companies that make wristwatches that are as uniquely styled as Graham watches. If you want something that will make a statement, this is a company you should consider when buying a luxury watch. Read on for the full Graham watches review. The build quality of Graham watches is exceptional; the company simply does not believe in cutting corners. They use sapphire crystal on all of their watches but they also add anti-reflective coating to both sides of the glass. Cases are made from stainless steel, 18k gold, carbon fiber, and high tech ceramics. Their models offer good water resistance up to 600 meters and their diving watches feature helium escape valves. These are tough, well-made timepieces that should last for decades with proper care. These watches feature Swiss-made automatic mechanical movements. Unlike most modern watchmaking companies, they don’t seem to have any models with quartz movements. They do like elaborate complications, however, so you’ll find models with alarms, a tourbillon, multiple time zones, chronograph features and more. A few of their models offer a skeleton design so that you can see the moving parts. George Graham was known for inventing a number of different mechanical watch parts that are now considered essential, and the company continues their history of innovation. They use helium escape valves for their diving watches, multiple complications, and are fond of including a tourbillon, which helps keep accurate time while offsetting the negative effects of gravity on the timepiece. The company is constantly updating their product line with new features. Styling is big and bold; these are not watches for the timid or for individuals with small wrists. They have oversized crowns, oversized faces, and big dials. Models favor the sporty, chronograph look, but there are also a few models that offer a more austere, traditional look. Fans of complications will love the brand, as they offer a lot of bells and whistles that you won’t find with many other brands in the same price range. There are models with gold cases and high-quality diamond accents for those who like a little bling with their wristwatch. Many models are limited editions, and some are produced in quantities of as few as 50 pieces. All models are sold with a custom box and a zippered travel pouch. 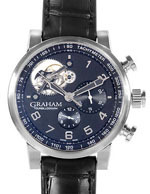 As with most high end mechanical timepieces, you will have some maintenance issues with Graham watches. Your timepiece should be inspected by a qualified jeweler every two years or so to ensure that the watertight seals remain intact. The watch should be sent back to the manufacturer or an authorized service center every five years or so for inspection and servicing. This will involve cleaning, disassembly, and inspection/replacement of worn parts. Aside from these considerations, you should store in a cool, dry place and keep them away from extremes of temperature or strong magnetic fields, which can harm the movement. You should store your watch in a watch winder if you are not wearing it regularly in order to keep it running smoothly and keeping accurate time. With proper care, you’ll find that they should be able to run well for decades to come. The warranty f is the industry standard of two years. This will protect you against defects in materials and craftsmanship. These are high quality, thoroughly tested timepieces, so defects should be quite rare. All of this quality comes with a price, so it shouldn’t surprise you to see that prices tend to the high side. The least expensive models we’ve seen have list prices just above $4000, with prices topping out at about $50,000 or so. This puts the company’s products in line with other luxury brands, such as Rolex, though these watches are produced in far fewer numbers. Most, if not all, of the company’s models are limited in production, with numbers falling in the 50 to 250 piece range for production. While they are expensive, they are also comparatively rare. Collectors are quite fond of the brand, and vintage models and out of production limited edition examples can sell for substantial prices on the collector’s market. We’re not necessarily recommending that you buy as an investment, but you could easily see today’s purchase increasing in value with time. 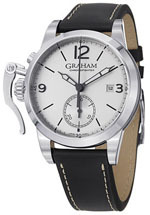 Like many luxury watchmakers, the company tries to control both the pricing and the distribution of Graham watches in order to avoid diluting the brand name. Makers of high end goods aren’t interested in seeing their products become commodities or in seeing them become perceived by the public as either common or ordinary. In order to maintain this, the brand is sold only through a select number of retailers around the world, and these are usually high end jewelry stores located in major cities and tourist destinations. 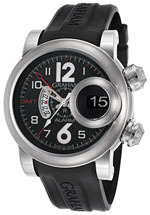 You cannot buy Graham watches at the company Website. Pricing is strictly controlled by the company, so you’re unlikely to see any difference in price from one authorized retailer to another. There are a number of “gray market” retailers out there, however, and because of this, it is possible to buy at a discount online if you’re willing to shop around. As many of the company’s models are limited in production, don’t be too surprised if no single retailer carries all models. That said, most sellers should have a good representative sample of the product line for sale. When it comes to luxury watches, we favor inventive design and mechanical complications. Graham watches offer both, and they add to that impeccable build quality and lots of extra touches that demonstrate that they simply love what they do – making interesting and high quality luxury timepieces. Graham watches aren’t inexpensive, but they are rare and unusual and are built to last for many years. If you want to buy something that will attract attention, offers interesting features and will likely run forever, then Graham watches might be a good choice for you. Are Designer Watches Worth the Price?